The makeshift engines in the J-20 mean it cannot fly or fight as a true fifth-generation jet, and its stealth has been compromised. It looks like China rushed the plane into service, and it won’t really be operational for at least a year. Chinese state media announced on Friday that the Chengdu J-20 stealth jet had officially entered into service as a combat-ready platform – but inside sources say it’s a long way from fighting fit and has an embarrassing flaw. Sources with knowledge of the J-20’s development told the South China Morning Post that the jets that entered service won’t feature the engine China custom-built for the platform. The result is an under-powered, less stealthy jet that can’t cruise at subsonic speeds, and is therefore not a true fifth-generation fighter. The Post pinned the jet’s troubles on an engines test in 2015, when the custom-built engine exploded. The paper’s sources attributed this to China’s inability to consistently build engines that can handle the extreme heat of jet propulsion. “It’s so embarrassing to change engines for such an important aircraft project several times … just because of the unreliability of the current WS-15 engines. It is the long-standing core problem among home-grown aircraft,” one of Post’s sources said. Times ASI via FlickrChina’s Chengdu J-20. The older engines, called WS-10Bs, are basically the same kind used in 1998 and 2002 with the older J-11 and J-10 fighters. 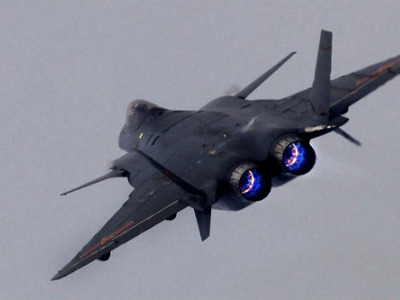 Without the new engines, called WS-15s, the J-20 can’t supercruise, or fly above the speed of sound without igniting its afterburners like the US’s F-22 and F-35 can. “Afterburners do make any fighter much easier to detect, track and target using Infra-Red and Electro-Optical systems at closer ranges when in use,” Justin Bronk, a combat aviation expert at the Royal United Services Institute, told Business insider. “The major drawback from not having the ability to supercruise in this case would be having to chose between using a great deal of fuel to go supersonic or stay subsonic and accept shorter effective range from the fighter’s missiles and an inferior energy position compared to a supercruising opponent,” Bronk said, referencing how the missiles on the J-20 won’t perform as well if not fired at above sonic speeds. For the J-20, experts have assessed that the goal of the platform is to launch long-range missiles at above sonic speeds. A senior scientist working on stealth aircraft previously told Business Insider that the J-20’s design has a decent stealth profile from the front angle, but from other aspects, it can be exposed. The scientist requested anonymity due to the sensitive nature of their work. According to Bronk, the second choice of engine may exacerbate that problem. A US Air Force affiliate researching the Chinese People’s Liberation Army Air Force told Business Insider that an analysis of imagery suggested the service’s 9th Brigade traded its Russian-made Su-30s for J-20s, but disputed whether the jet was really operational in the way Western militaries use the word. “The aircraft and its pilots and maintenance group need to master the type before it can be sent on a ‘real’ mission (not a training mission),” according to the researcher, who remains anonymous as their employer’s report is yet to be released. The researcher added that even for planes that aren’t stealth and as radical different as the J-20, that process can take up to a year. They also told Business Insider the new WS-15 engines likely won’t be added until 2020. So while China claims it has become the first nation other than the US to field a fifth-generation stealth jet, at the moment it looks like it’s hardly stealth, hardly fifth-generation, and a long way from the field.